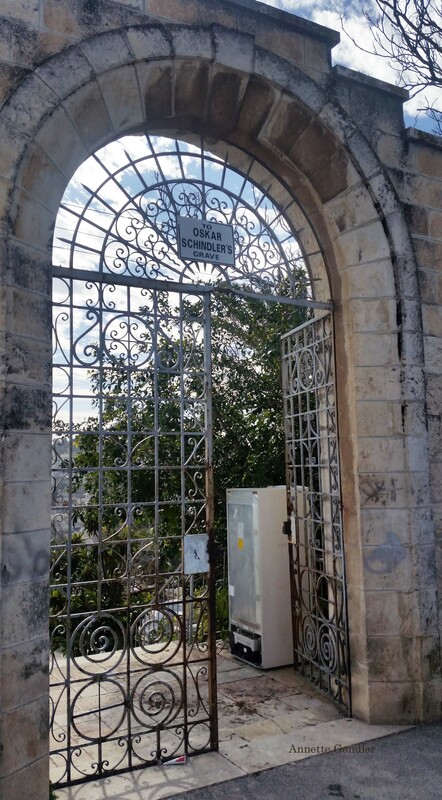 One of the things I love about Jerusalem is that you stumble upon historically significant sites all the time. Such was the case last weekend, when my husband and I set out to walk to the Kotel (Western Wall) in the Old City. This was a solid 45 minute walk from our rented apartment, but of course we stopped here and there to look at stuff, such as enjoying this view of Mount Zion from above the Jerusalem Cinematheque, with the Hinnon Valley in between. 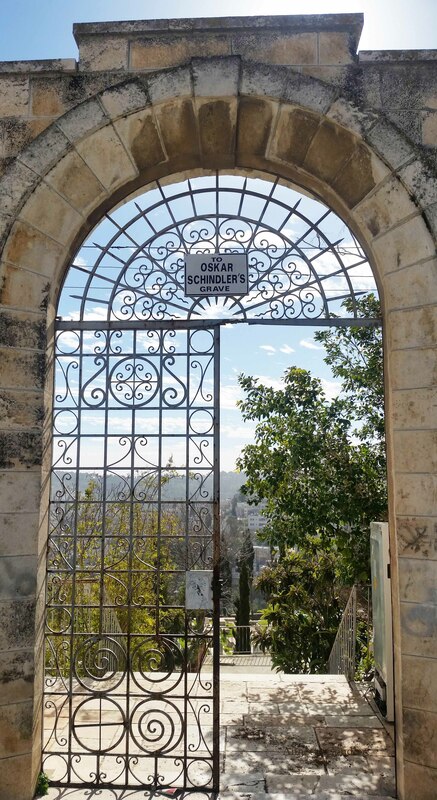 This cemetery gate announcing that Oskar Schindler’s grave was to be found here! 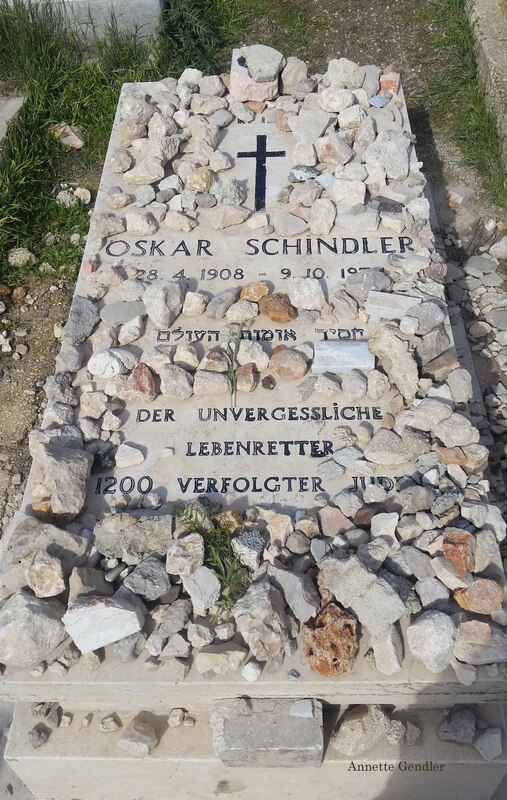 We had not been looking for this, nor were we even aware that Oskar Schindler was buried here in Jerusalem. But he counts among the Righteous among the Nations, who saved Jewish lives during the Holocaust. So of course we picked up a few stones to place on his grave and entered to pay our respects. Stepping into the gate and down the several terraces that comprise the cemetery, we found, however, no signs to Schindler’s grave. Why would there be signs, right? This is Israel, after all, and things tend to be done the hard way. 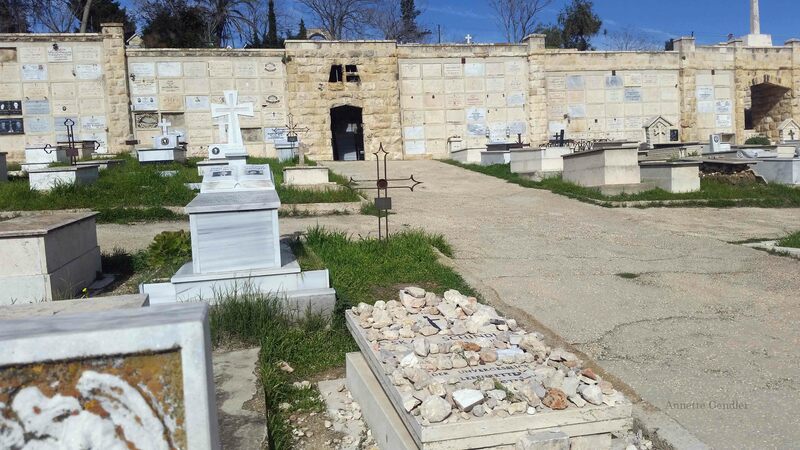 So we wandered about the Mount Zion Catholic Cemetery and as we scanned the many inscriptions in Arabic, we started doubting we’d ever find what we were looking for. Thankfully, I eventually had the idea to Google his grave and hey pronto, found a description on how to find Oskar Schindler’s grave. 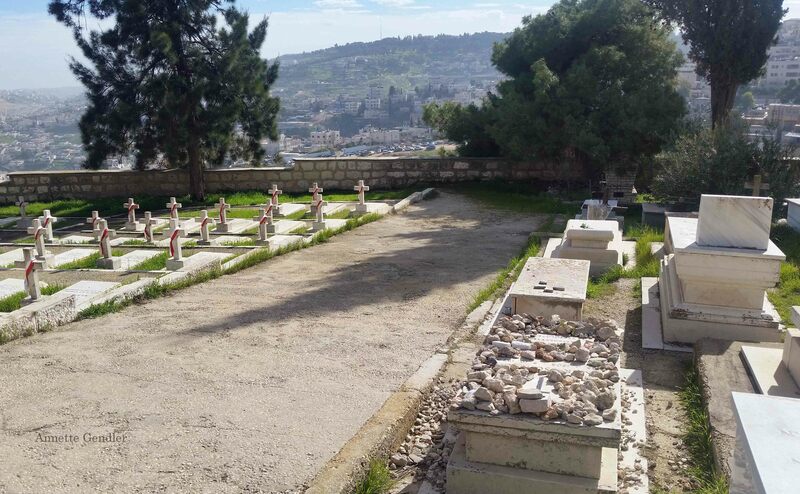 From this terrace with a view of the sprawl of East Jerusalem, look down at two o’clock and you will spot a flat grave with lots of stones on it. That is Oskar Schindler’s grave in the upper corner of the path crossing you see below. View from Schindler’s grave across East Jerusalem. 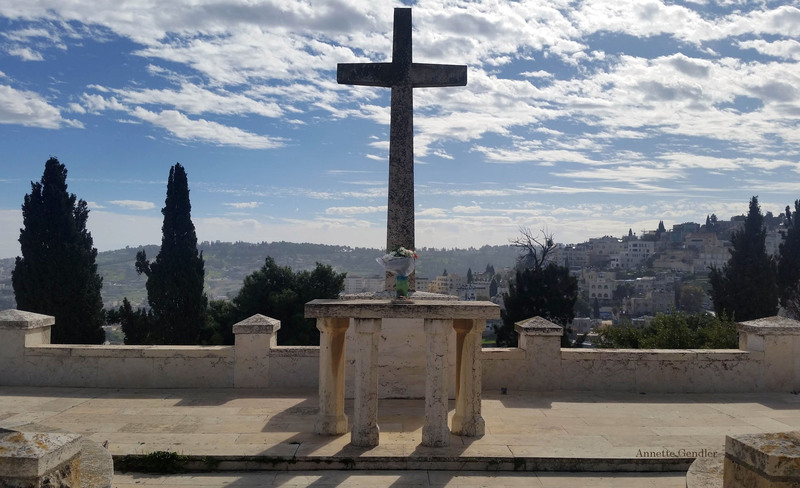 The small white crosses with the red and white ribbons are for Polish soldiers, who fought and died in British Mandate Palestine. Back up the mountain through the slightly disheveled cemetery. And why, pray tell me, is a refrigerator sitting in the entryway? While no one is out and about and it’s clearly been standing there for a while? What a wonderful find. Thanks for sharing it, Annette. I just read the book and watched the movie last year. It was so moving. Thanks, Janet. Glad it resonated with you! How intresting! I’ll för sure go there and try to find the grace! Thank’s! Good! It’s easy to find once you know where to look! I knew he was buried in Israel, but not where. 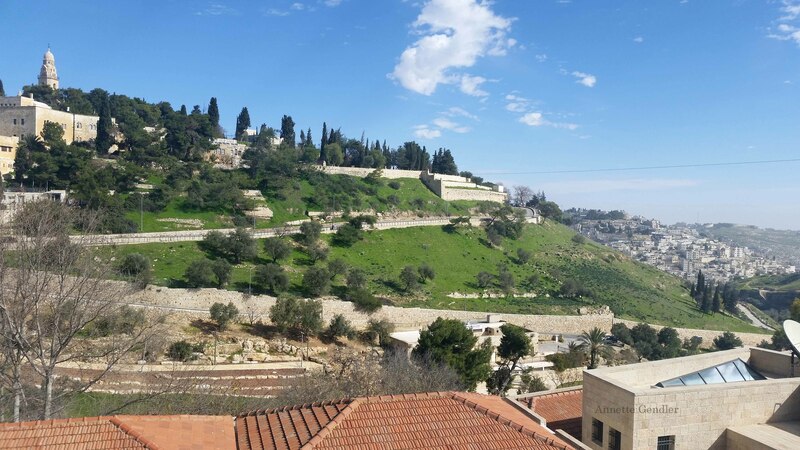 The valley between Mount Zion and Cinematheque is the Hinnom valley (Gai ben Hinnom in Hebrew), the Kidron is between the Mount of Olives and the Old City walls. 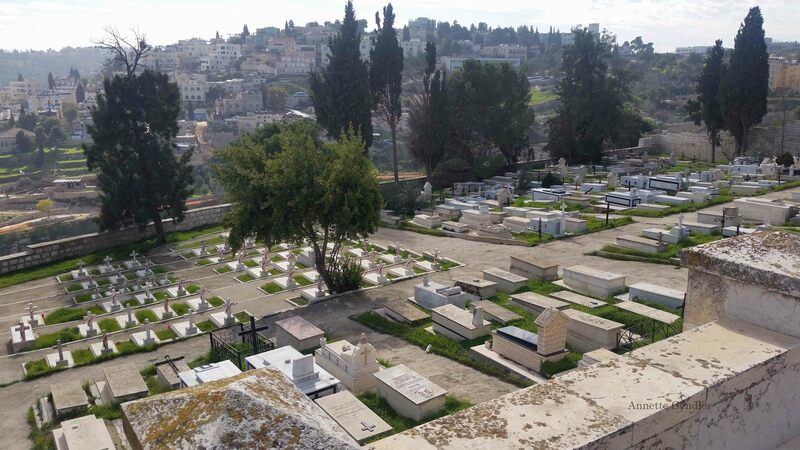 The view from Schindler’s grave is actually looking west towards Abu Tor. Glad you enjoyed happening upon the discovery. Thanks for the info! 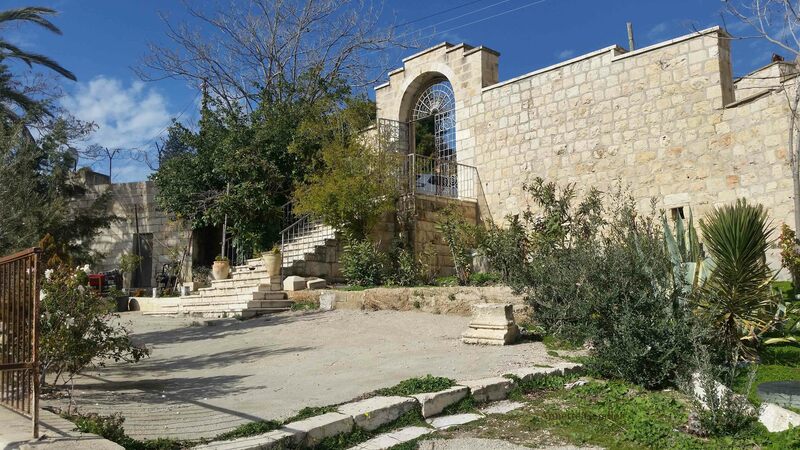 A good part of Abu Tor is considered East Jerusalem, so I think I’m fine with that 🙂 I just walked around there a few days ago. Next time I’m in the area, I will look for the Jewish burial sites you mention. Very interesting!